Create a classic look with this 3-piece set from Carbon Loft. The soft comforter is made from microfiber and filled with polyester for added warmth. 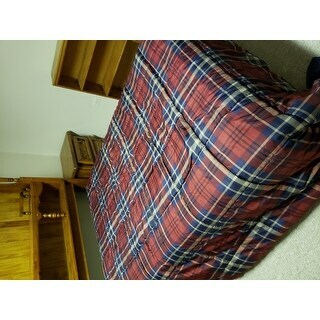 A blue and red plaid pattern covers the top side, and a solid navy color is featured on the reverse. Let me begin this review by clarifying that I don't completely regret this purchase. What arrived was remarkably soft and definitely microfiber. It's high quality in material and stitching, well worth the price. The problem is that I needed a California King, and what I recieved is more along the lines of a standard or possibly undersized King. On the first night of using it, I was wishing i had more covers on either side of the bed. As someone who likes oversized comforters or just having enough for two people, this was an issue. Also, I am 100% sure that this is NOT down alternative. I worked in a department store in the home department for an extended period and became intimately familiar with filler materials and bedding, and this is definitely just standard thin polyester fill. The comforter is very light and breathable. Once again, I do not regret this purchase, but the wording in the product listing was perhaps stretched. What you will receive is on the same standard as what could probably be purchased at *** . This listing is definitely cheaper, however. All in all, worth the buy, but be aware of what you will receive. A great buy. I bought this set for my son. My son likes his comforter set. Very soft and comfortable. I like this comforter, it's light weight, but not too light weight, yet warm. Colors are as pictured. 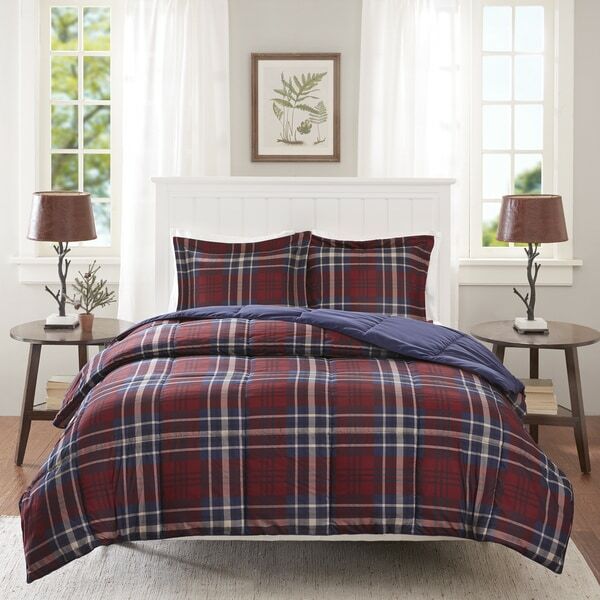 It's an inviting comforter with rich navy blue and maroon plaid. Perfect for the north east winters. Nice plaid, and good color combo for a male. Navy, red and beige. I was surprised how heavy this set was. It was well made and looked great. The colors are burgundy and navy. I would recommend this product. Got this for our second guestroom that we will be using as a "dorm room" for our nephew this semester. At first I ordered it because it looks comfy and is for a boys room. It didnt have to be anything glamorous since it's one of the 2 basement guest rooms and wont be used like the guest room on our 2nd floor. But I still wanted something anyone could use and feel comfortable. Since it is a walk out basement and gets lots of light, I wasnt concerned with the dark color. Plus I'll be painting the walls a nice tan to warm it up. But after seeing pics on this site of people who ordered it, i actually tried to cancel this. It didnt look as nice as i remembered. But as soon as i got it, it's a keeper. Soft, nice weight, i ordered a king to put on a full since i like it to have a little overhang especially after we get a bed frame set up. This is just a pic with mattress on the floor. This is definitely a keeper, you wont be disappointed. I just received my comforter and I LOVE it! It is soft and just the right thickness. The colors are great! I would definitely recommend to a friend! 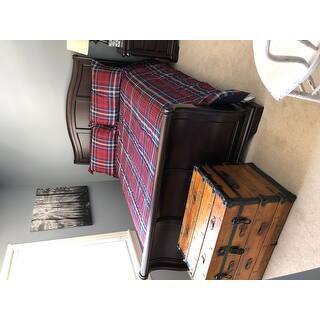 My grandson is very happy with his plaid comforter. He will grow into it. Looks great! I love it! The delivery of it was quick and it fits the bed nicely. I will definitely use Overstock.com again in the future! Exactly what I wanted. Most impressive part it didn’t smell. I have ordered comforters online before that come with an odd Oder. So that’s always the first thing I check. Definitely did not let me down. 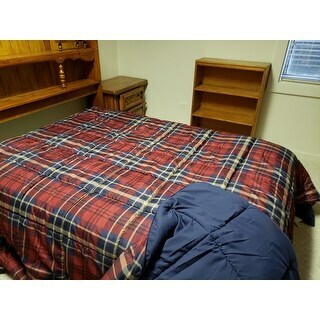 The comforter has nice classic colors. The fabric is not as soft as I would like, was hoping for more of a cotton texture but this has a silky polyester feel. Overall OK though and it seems to be well made. It's exactly what I expected. Not too heavy not too light. Very soft and well made ! Super soft and size and color described perfectly. Nice and cozy, true to color in the photo.